Everyone loves a CGI film these days don't they? 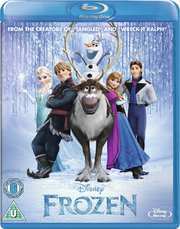 And probably the most prolific creator of them is Disney Animation Studios, who have their latest big screen feature Frozen coming to DVD, Blu-ray, 3D Blu-ray and download this coming 31st March. Directed by Chris Buck and Jennifer Lee, this features the voices of Kirsten Bell, Josh Gad and Idina Menzel. With a soundtrack from Kristen Anderson-Lopez and Robert Lopez, plus original score from Christopher Beck, it also features exclusive artwork by Marc Davis. The DVD release will carry a recommended retail price of £17.99 and include the Get a Horse theatrical short as an extra. Whilst the Blu-ray versions are priced at £21.99 and £25.99 for the standard and 3D versions respectively. Extras on the HD version add The Making of Frozen: The Musical featurette, D’frosted: Disney’s Journey From Hans Christian Anderson to Frozen featurette, deleted scenes, trailer and music video. Fearless optimist Anna sets off on an epic journey, teaming up with rugged mountain man Kristoff and his loyal reindeer Sven, to find her sister Elsa, whose icy powers have trapped the kingdom of Arendelle in eternal winter.